This luscious recipe for honey chicken kabobs is perfect for any spring or summer celebration. The chicken is marinated in a bright mixture of honey, lemon juice, olive oil, soy sauce, and oregano, which makes it tender, juicy, and flavorful. You could use other herbs in the marinade, such as thyme or basil if you prefer. You can marinate the chicken for this recipe up to 12 hours; the longer it marinates, the more flavorful the finished dish will be. Make all the skewers the same, or vary some, depending on your tastes and your guest's. Use your favorite vegetables in this easy recipe. If you are using tender veggies, such as bell peppers, mushrooms, or summer squash, the vegetables do not need to be precooked. You could add thick quarters of tomatoes or exotic mushroom varieties. If you want to use harder veggies such as carrots or potatoes, they will need precooking before they are skewered with the chicken. Simmer root vegetables in water until they are slightly softened. Then drain them, skewer them with the chicken, and grill until done. These kabobs are delicious served on a bed of hot cooked rice or rice pilaf. Serve some toasted garlic bread on the side, and a fruit salad for a cooling contrast. Cut the chicken into 1-1/2" pieces. In a medium bowl, combine the soy sauce, honey, lemon juice, olive oil, oregano, salt, and pepper and mix well. Add chicken pieces, turn to coat. Cover and refrigerate for 6 to 12 hours. When ready to cook, prepare and preheat the grill for medium coals. Drain the chicken, reserving marinade. Cut peppers into 1-1/2"-pieces. Cut asparagus into 2"-long pieces. Cut the bottoms of the mushroom stems off; leave them whole for grilling. Slice zucchini into thick slices. Thread the chicken and vegetables onto metal skewers. Bamboo skewers won't work as well in this recipe because they will burn in the time it takes the chicken and vegetables to cook thoroughly. 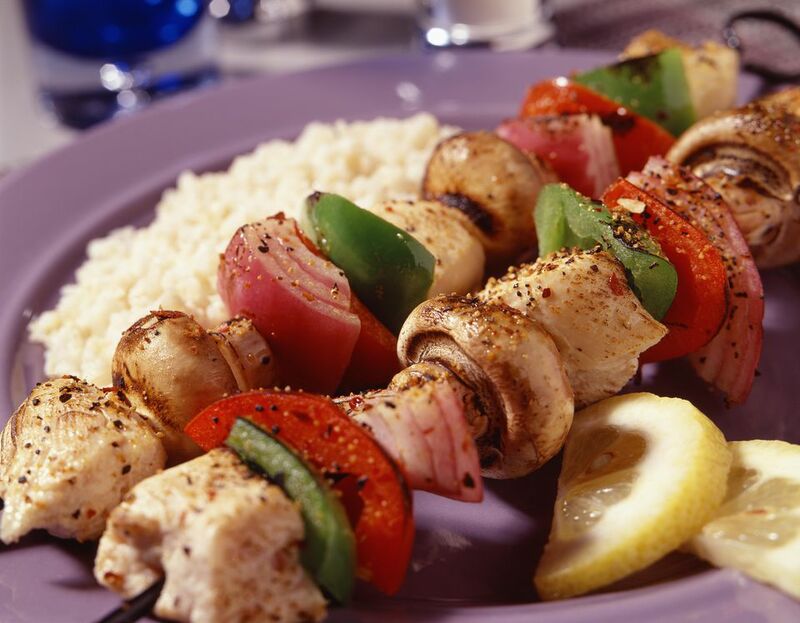 Place the skewers on the hot grill and cook 6" from medium coals, turning frequently and brushing with marinade, for 10 to 12 minutes or until chicken is thoroughly cooked and vegetables are crisp-tender. Discard any remaining marinade.